We, the undersigned, called for the indictment and prosecution of John Winston Howard (currently Australian Prime Minister) for acts of terrorism and war crimes. 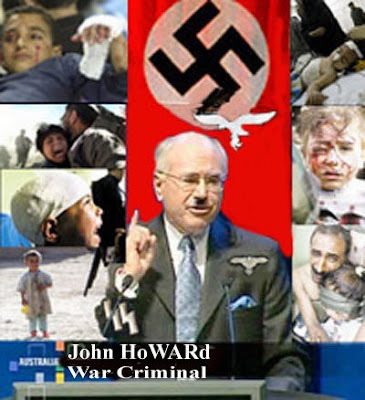 We believe that under Australia's Criminal Code Act 1995, and under the articles of the International Criminal Court, there is a prima facie case for the prosecution of Howard for complicity in illegal attacks upon and mass murder of civilian populations of Afghanistan and Iraq, between 2001 and 2005. We reject utterly the claim that any of these crimes could be carried out under any 'democratic mandate' from Australian citizens. We urge responsible prosecution authorities such as the Australian DPP, and the International Criminal Court to take immediate action. What about asking about John Howard's top three failures? War crimes against humanity. Waging illegal and degrading war against innocent citizens of Iraq and Afghanistan. Introducing draconian laws and racism.